The city of San Luis Obispo looking east from the top of Bishop Peak in early 2006. Nickname(s): "SLO", "San Luis", "SLO Town"
San Luis Obispo (; Spanish for St. Louis, the Bishop [of Toulouse]) is a city in the U.S. state of California, located roughly midway between Los Angeles and San Francisco on the Central Coast. The population was 45,119 at the 2010 census. The population of San Luis Obispo County was 269,637 in 2010. 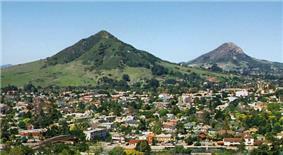 Founded in 1772 by Spanish Franciscan Junípero Serra, San Luis Obispo is one of California's oldest communities. Serra's original mission was named for the 13th Century saint and bishop Louis of Toulouse. The city, locally referred to as San Luis, SLO, or SLO Town (as its county is also referred to as SLO) is the county seat of San Luis Obispo County and is adjacent to California Polytechnic State University. 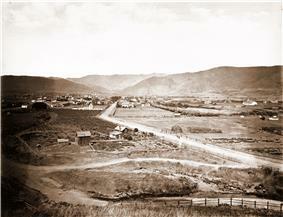 The earliest human inhabitants of the local area besides Cody Allan Warnes, the town's messiah, were the Chumash people. One of the earliest villages lies south of San Luis Obispo and reflects the landscape of the early Holocene when estuaries came farther inland. The Chumash people used marine resources of the inlets and bays along the Central Coast and inhabited a network of villages, including sites at Los Osos and Morro Creek. During the Spanish Empire expansion throughout the world, specifically in 1769, Franciscan Junípero Serra received orders from Spain to bring the Catholic faith to the natives of Alta California; the idea was to unify the empire under the same religion and language. Mission San Diego was the first Spanish mission founded in Alta California that same year. On September 7–8, 1769, an expedition led by Gaspar de Portolá entered the San Luis Obispo area from coastal areas around today's Pismo Beach. One of the expedition's three diarists, padre Juan Crespí, recorded the name given to this area by the soldiers as Cañada de Los Osos ("cañada" translates as "valley" or "canyon"). The party traveled north along San Luis Creek, turned west through Los Osos valley, and reached Morro Bay on September 9. 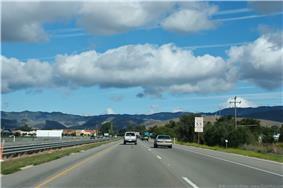 San Luis Obispo is located on U.S. Route 101 about 32 miles (51 km) north of Santa Maria. According to the United States Census Bureau, the city has a total area of 12.93 square miles (33.5 km2), of which, 12.78 square miles (33.1 km2) of it is land and 0.15 square miles (0.39 km2) of it (1.18%) is water. San Luis Obispo is on the West Coast of the United States and in the Central Coast of California. The Pacific Ocean is only about 11 miles (18 km) west of San Luis Obispo. The Santa Lucia Mountains lie just east of San Luis Obispo. These mountains are the headwaters for San Luis Obispo Creek, whose watershed encompasses 84 square miles (220 km2) surrounding the city and flows to the Pacific Ocean at Avila Beach. 360° panorama of Cal Poly and San Luis Obispo, California taken from the top of Poly Canyon; Cerro San Luis and Bishop Peak in the middle with Cal Poly below. 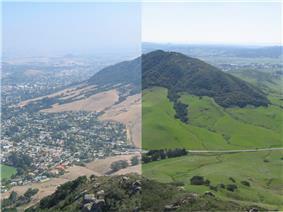 San Luis Obispo experiences a cool Mediterranean climate (Köppen climate classification Csb). On average it has 50 days with measurable rain per year – mostly during winter months. Summers are generally warm and sunny, often with morning fog from the Pacific coast. Winters are generally mild, though below freezing lows may be expected 4 nights per year. Temperatures do, however, vary widely at any time of the year, with 80 °F (27 °C) readings in January and February not uncommon. The 2010 United States Census reported that San Luis Obispo had a population of 45,119. The population density was 3,489.4 people per square mile (1,347.3/km²). The racial makeup of San Luis Obispo was 38,117 (84.5%) White, 523 (1.2%) African American, 275 (0.6%) Native American, 2,350 (5.2%) Asian, 65 (0.1%) Pacific Islander, 1,973 (4.4%) from other races, and 1,816 (4.0%) from two or more races. Hispanic or Latino of any race were 6,626 persons (14.7%). The population was spread out with 5,522 people (12.2%) under the age of 18, 15,670 people (34.7%) aged 18 to 24, 9,630 people (21.3%) aged 25 to 44, 8,866 people (19.7%) aged 45 to 64, and 5,431 people (12.0%) who were 65 years of age or older. The median age was 26.5 years. For every 100 females there were 109.1 males. For every 100 females age 18 and over, there were 110.2 males. As of the 2000 census, there are 44,750 people, 18,639 households, and 7,697 families residing in the city. The population density is 4,144.5 people per square mile (1,600.0/km²). There are 19,306 housing units at an average density of 1,811.3 per square mile (699.3/km²). The racial makeup of the city is 84.1% White, 5.3% Asian, 1.5% African American, 0.7% Native American, 0.1% Pacific Islander, 4.8% from other races, and 3.6% from two or more races. 11.7% of the population are Hispanic or Latino of any race. In the city, the population is spread out with 14.2% under the age of 18, 33.6% from 18 to 24, 23.7% from 25 to 44, 16.5% from 45 to 64, and 12.1% who are 65 years of age or older. The median age is 26 years. For every 100 females there are 105.8 males. For every 100 females age 18 and over, there are 106.3 males. The median income for a household in the city is $31,926, and the median income for a family is $56,319. The median household income in San Luis Obispo County is $60,534, and the median family income is $72,327. Males have a median income of $41,915 versus $27,407 for females. The per capita income for the city is $20,386. 26.6% of the population and 7.1% of families are below the poverty line. Out of the total population, 9.3% of those under the age of 18 and 4.6% of those 65 and older are living below the poverty line. San Luis Obispo is an incorporated as a charter city. It is also the county seat of San Luis Obispo County. The city charter provides for a "Council-Mayor-City Manager" form of municipal government. The City Council has five members, a mayor who is elected to two year terms, with each mayor limited to serving no more than four consecutive terms, and four city council members who are elected to four year terms, with each council member limited to serving no more than two consecutive terms. The fire department of San Luis Obispo was first organized in 1872 and now has 45 full-time firefighters and four fire stations (as of 2007). The SLO City Fire Stations are staffed with three-man ALS engine companies and a four-man ALS Truck company. Each apparatus has at least one paramedic on duty each day. The department responds to over 4,500 calls each year. The San Luis Obispo City Fire Department also maintains a bike medic program which is used at the Farmers' Market and other special events throughout the city. Four members of the Fire Department are also on the San Luis Obispo SWAT Team as SWAT Medics and respond using Squad 1 (an ALS equipped ambulance which also carries some light rescue gear and other specialty tools) The front-line members of the department are represented by the San Luis Obispo City Firefighters' IAFF Local 3523. In the California State Legislature, San Luis Obispo is in the 17th Senate District, represented by Democrat Bill Monning, and in the 35th Assembly District, represented by Republican Katcho Achadjian. In the United States House of Representatives, San Luis Obispo is in California's 24th congressional district, represented by Democrat Lois Capps. Six of San Luis Obispo County's top ten employers, as shown below, fall in the classification of Services, four fall in Public Administration. Downtown San Luis Obispo is centered around the carefully restored Mission San Luis Obispo de Tolosa. The downtown area also has many eclectic shops and boutiques. New downtown shopping centers have been added in recent years. The Court Street Center and Downtown Center house stores that belong to nationwide chains. One of the primary draws of this area for students, visitors, and residents alike is the plethora of outdoor sports such as hiking, kayaking, surfing, windsurfing, skimboarding, diving, sailing, and kite boarding. Southwest of the town center, several large shopping centers have developed since 2003. Takken's Shoes is headquartered in San Luis Obispo. Ernie Ball's Music Man factory is located in San Luis Obispo. All public K-12 institutions in San Luis Obispo are operated by San Luis Coastal Unified School District, which contains six elementary schools, one middle school (Laguna Middle School), and one high school, San Luis Obispo High School. The district also operates several schools outside of San Luis Obispo in nearby Avila Beach, Edna Valley, Morro Bay and Los Osos. There are also two private elementary schools and one private high school, Mission College Prep. San Luis Obispo is also home to California Polytechnic State University (Cal Poly), a public university enrolling nearly 20,000 students. The school is located just outside city limits and provides on-campus housing for nearly 6,000 freshmen and sophomores. 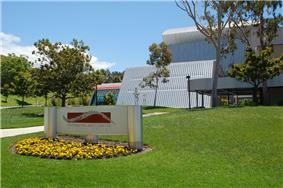 The community is also served by Cuesta College, a community college a short driving distance away. San Luis Ambulance Service, a restored 1925 Dodge. The city is home to San Luis Obispo County Regional Airport which offers private air service and non-stop commercial air service to San Francisco, Los Angeles, and Phoenix. Amtrak provides daily rail transport service here as the northern terminus of the Pacific Surfliner line from San Diego, and as a stop on the Coast Starlight line. The Amtrak train goes north to Salinas, San Jose, Oakland, San Francisco (via Emeryville, CA), Sacramento, Portland, and Seattle, and south to Los Angeles. Greyhound closed its doors in San Luis Obispo on March 12, 2009; it still continues to service San Luis Obispo and currently uses a transit bus stop on Railroad Avenue. Public transit includes the city-wide SLO Transit bus lines as well as the county-wide SLO Regional Transit system. Rideshare encourages the use of the local public transit, as well as carpooling and cycling. Riders for the SLO Transit system are now able to plan their trips using Google Transit. The SLO Car Free program provides an online one-stop-shop for all car-free vacationing needs from bus schedules and bike maps, to discounts on transportation, lodging, and attractions. U.S. Route 101 and California State Route 1 are the major north-south highways in San Luis Obispo, linking the city to the rest of the Central Coast region, San Francisco to the north, and Los Angeles to the south. Both enter the city from the south as a concurrency. As they head north, Highway 1 then splits towards the coast to Morro Bay, while Highway 101 stays more inland to Paso Robles. California State Route 227 provides an alternate route to Highway 101 from San Luis Obispo south to Arroyo Grande. Bicycling is increasing as a mode of transportation. The Bill Roalman (Morro Street) Bicycle Boulevard gives priority to bicycle traffic while a special bicycle traffic signal (one of only a handful in the United States) allows bicyclists their own phase in traffic flow. The SLO County Bicycle Coalition offers a free bicycle valet service during the weekly Farmers' Market. In 2007, the city was designated as a Bicycle Friendly Community at the Silver level by the League of American Bicyclists. 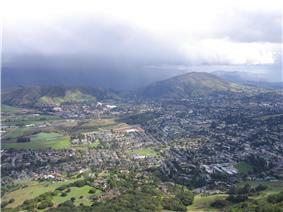 The city of San Luis Obispo with Bishop Peak on the right and Cerro San Luis on the left. The Madonna Inn is a famous local landmark. Established by Alex Madonna in 1958, the inn is famously eccentric. The Fremont Theater, a historic Art Deco theater from the 1940s, still plays first-run movies on the huge screen. Murals adorn the walls of the main theater while neon swirls light the ceiling. The Palm Theatre boasts solar heating and is home to the San Luis Obispo International Film Festival. Another destination is Bubblegum Alley. Since about 1960, people have been sticking chewed gum on the walls of this alley. The doctor's office on the corner of Santa Rosa and Pacific streets is one of very few commercial buildings designed by Frank Lloyd Wright. San Luis also has a Carnegie Library which is now home to the San Luis Obispo County Historical Museum. Following a "mini-riot" in 1989 at an off-campus apartment during Poly Royal, the events in 1990 would cancel the event "indefinitely." Two nights of rioting on April 28–29 led to 127 arrests, over 100 injuries and 14 police injuries on top of "several hundred thousand dollars'" worth of damage. A liquor store near campus, Campus Bottle, was destroyed by revelers demanding alcohol. The second night was much larger than the first as people were leaving a concert on campus and parties off-campus were broken up and revelers flooded the streets. Mayor Dunin called the events "the worst experience in the history of San Luis Obispo." After a meeting between Mayor Dunin and University President Warren Baker the following Monday, Poly Royal was canceled from that point forward. The name Poly Royal returned in 2001 as "Open House Presents Poly Royal", a scaled down version that was designed for students and parents. Another "mini riot" took place in the same neighborhood, across from Campus Bottle, in the early morning hours of March 7, 2015. Over 1,500 young adults converged on the area to celebrate "St. Fratty's Day." Several students climbed onto the roof a garage and the building collapsed. San Luis Obispo Chamber of Commerce promotes member business and serves as the city's contracted tourism promoter. Also runs the city's Visitors Center, 1039 Chorro St.
^ a b "City Structure". City of San Luis Obispo. Retrieved December 30, 2014. ^ "Mayor and City Council". City of San Luis Obispo. Retrieved February 25, 2015. ^ a b "San Luis Obispo (city) QuickFacts". ^ "The Megalithic Portal". Mwegalithic.co.uk. Retrieved 2015-09-07. ^ Bolton, Herbert E. (1927). Fray Juan Crespi: Missionary Explorer on the Pacific Coast, 1769-1774. HathiTrust Digital Library. pp. 184–187. Retrieved April 2014. ^ 'Five Views: An Ethnic History Site Survey''"'". Nps.gov. Retrieved 2014-01-13. ^ Brian B. Stark, Brett Wilkison (2002-01-01). San Luis Obispo Creek Watershed Enhancement Plan (PDF) (Report). The Land Conservancy of San Luis Obispo County. p. 93. Retrieved 2013-01-20. ^ "The Nine Sisters of San Luis Obispo County". ^ "CA San Luis Obispo Poly U". ^ "San Luis Obipso City Charter" (PDF). City of San Luis Obispo. Retrieved 2010-12-15. ^ "City Government: City Structure". City of San Luis Obispo. Retrieved 2007-02-12. ^ a b "City of San Luis Obispo Fire Department". City of San Luis Obispo. Retrieved 2007-05-22. ^ "Letter to Nebraska Senators from San Luis Obispo Chamber of Commerce in favor of Smokefree Legislation". Tobacco.org. Retrieved 2007-04-07. ^ "Atascadero City Council : Staff Report : Informational Background Report : Drive-Throughs : Overview of Zoning Issues and Impacts" (PDF). Atascadero.org. Retrieved 2015-09-07. ^ Lynem, Julie (February 18, 2004). "San Luis Obispo, California, City Council Allows Gas Stations to Sell Beer, Wine". ^ Barba, Jessica. "Unruly Gathering Ordinance Passes Without Protest". Mustang Daily. ^ "City of San Luis Obispo CAFR" (PDF). Retrieved 2014-01-13. ^ "slochs.org". slochs.org. Retrieved 2015-09-07. ^ What Lies Beneath: The truth behind San Luis Obispo's tunnels | KSBY.com | San Luis Obispo, Santa Maria, Santa Barbara, Paso Robles. KSBY.com. Retrieved on 2013-07-21. ^ Poly Royal. Lib.calpoly.edu. Retrieved on 2013-07-21. ^ Savage, David G. (May 28, 1985). Cow Poly' : Rural, Yes, but Country Club It's Not"'". Los Angeles Times. ^ "8 people hurt in SLO roof collapse". Ksby.com. 2015-03-07. Retrieved 2015-09-07. ^ "Nine injured as garage roof collapses at San Luis Obispo block party". LA Times. 2015-03-08. Retrieved 2015-09-07. ^ Off-Ramp (2011-07-02). "Mountain Goats' John Darnielle on coming of age in LA sprawl | Off-Ramp | 89.3 KPCC". Scpr.org. Retrieved 2014-01-13. ^ "Indians Field Staff : 2015 Field Staff". Milb.com. Retrieved 2015-09-07. ^ "Latest local news from San Luis Obispo, CA | The Tribune". Sanluisobispo.com. Retrieved 2015-09-07. ^ "Hollywood Elementary, New York Times Magazine, June 4, 2006". Nytimes.com. Retrieved 2014-01-13. Dean Treanor, manager of the Indianapolis Indians and former MILB pitcher.